The Spanish classes are from 8:00am to 6:00pm. As the exam usually begins around 4:00pm, some may be out as early as 4:30pm or 5:00pm depending on how quickly they complete the exam. English and Spanish classes are offer once a month at our location. Look for the words “SPANISH” when registering. At the end of each open class we offer the ServSafe certification exam. We use the ServSafe exam which is ANSI approved and accepted nationwide by every jurisdiction, everywhere in the country. The exams are multiple choice questions with 90 questions on each exam. You must score a 75% to become certified. You can get the exam printed in English, Spanish. When using a foreign language exam, the questions will appear on the exam in both the foreign language and in English. It is a closed book/notes test. Translators are NOT allowed unless approved in advance by the testing organization. Some people finish in as little as 30 minutes while others may take the full 2 hours to finish. The ANSI Approved/ServSafe exam is sent to the ServSafe headquarters for scoring. We do not have control or influence in this scoring (for security purposes) and it takes about 2 weeks to get the results back from the scoring center. The textbook used for the English classes is the most up to date version of Food Safety for Managers. We can provide alternate books in Spanish. If you have an older book or from a different author, you may be able to use it as long as you make careful note of the several major changes in the food code. The Food Safety for Managers is written at a 9th grade reading level and is about 80 pages long. This textbook is a concise study guide to help prepare you for the exam. This food and safety class option is the same as our pretty famous open ServSafe® Certifications Classes just above, except that we bring the class to your business. Employees don’t have to make their way into our location, it can be tailored towards your business. Eight person minimum required. These are 6-hour seminars followed by 2 hours of exam time. It can be taught in English or Spanish. As of September 1, 2017, food establishments in Texas must have at least one certified food manager onsite during operating hours. With everyone above being required to carry a food handler card. Texas Food Handler who needs it? A food handler is a food service employee who works with unpackaged food, food equipment or utensils, or food contact surfaces, such as hostesses, bar-backs, kitchen staff, bussers, etc. As of September 1, 2016, all those listed above must become Texas certified food handlers. According to the Texas Alcoholic Beverage Commission (TABC), any employee who “sells, serves, dispenses, or delivers alcoholic beverages under the authority of a license or permit, including persons who immediately manage, direct, supervise, or control the sale or service of alcoholic beverages” can satisfy training needs with our TABC-approved online course. Your completion certificate is available instantly once you complete the course. We also report your course completion to the TABC. Instructor-led training (ILT) is the more traditional, formal version of training that takes place in a classroom in front of learners, while eLearning is web-based and can be taken at any time from an internet-connected device. And, then there’s blended learning. If you’re trying to find the best training program for your employees, there are a few things to consider when it comes to ILT vs. eLearning, or even blended training. ILT, or instructor-led training, is the type of training you’re most familiar with. It’s training that occurs in a classroom. There’s a teacher presenting the material. And, for many employees for many subjects, this can be the most effective method of training. All of this, however, depends on what your specific needs are, ServSafe Mgr. TABC Seller-Server or Texas Food Handler. Some topics will greatly benefit from instructor-led training. Some, however, will be better matched to eLearning. Really depends on the student. One of the greatest advantages of instructor-led training is that employees have the opportunity to ask questions. Highly-trained food safety/health inspectors/trainers and instructors can also adapt their presentations to the skill level and personality of the class they’re teaching and can keep you engage. Another indirect benefits stem from this. Since employees are in a classroom setting, their attention is more likely engaged with the material. And, as university reports, there’s an added value and sense of worth for in-person training, especially among food safety and customer service employees. eLearning, on the other hand, offers both opportunities and different challenges for your training program. eLearning refers to any training that takes place online, anywhere and any time. eLearning with ServA+ Food Safe Inspections, Inc. provides distinct advantages for companies. There’s a reason that more than 40% of Fortune 500 companies use eLearning with ServA+Food Safe Inspections, Inc. and 72% of organizations claim that eLearning provides them with a distinct competitive advantage. It’s specifically because of all those bells and whistles that eLearning can lose students in many ways. eLearning solutions that rely on overly flashy graphics or animations are distracting to students. eLearning can also become outdated, especially for rapidly evolving fields, unless active revisions are part of the training design process. Just like instructor-led training, eLearning courses must focus on the core principles of instructional design to accurately and concisely communicate information to your employees. No number of mobile apps, interactive videos, or VR experiences is going to change that. Quite simply, it depends. Your topic ServSafe Mgr. Course, TABC Seller-Server or Texas Food Handler, employee population, and training resources will all dictate whether ILT vs. eLearning will be more successful for you. ILT can incorporate many different styles of learning easily, and in-person training tends to be more personal and helps to build relationships. eLearning is more flexible, though, and learners can refer back to courses over and over. Blended learning incorporates benefits of both options to save time and money, while increasing overall employee engagement. Adrian Escobedo consultant can help you break down your specific needs and suggest options that would work best for you. Contact ServA+Food Safe Inspections, Inc at 972-214-8702 or email adrian@servaplusfs.com to help you determine which style of instruction is best for you and your organization. The best of both worlds is here!! 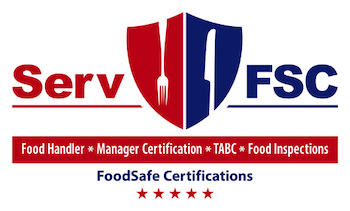 ServA+Food Safe Inspections, Inc.